NEW YORK, NY (June 14, 2018) – Engagement Labs (TSXV: EL) (OTCQB: ELBSF), an industry-leading data and analytics firm that focuses on the entire social ecosystem and its impact on business, today released its TotalSocial® ranking of the top personal care and beauty brands in the U.S based on social influence. The analysis is unique in that it combines offline and online consumer conversations. It is based on Engagement Labs’ proprietary TotalSocial data and analytics, which continuously measures the most important drivers of brand performance in both face-to-face and social media conversations. The brands in the top 10 have earned the highest TotalSocial scores in the category for the last six months, compared to the Company’s previous ranking in December 2017. In the previous ranking, Neutrogena had been pushed out of the top 10—however, stronger sentiment scores helped the skincare brand re-enter the list as it climbed up to number six. The brand’s key reason for success was stronger offline sentiment, which measures how positive its face-to-face conversations are. At the Consumer Electronics Show earlier this year, the skincare brand debuted a new beauty technology and smartphone app, which allows consumers to scan their skin and get tips on a skin regimen that fits their personal needs. Meanwhile, Burt’s Bees made its first appearance in the ranking, claiming the number eight spot. Remarkably, the brand’s strong improvement in offline sentiment and online influence, which measures the extent to which an influential audience is advocating for the brand in social media, created enough lift to carry the brand 13 spots. In early 2018, the National Eczema Association (NEA) awarded Burt’s Bees its Seal of Acceptance. Over the same period, Old Spice failed to engage consumers. The personal care brand experienced a steep decline in both offline and online influence as well as offline brand sharing, which is the extent to which people talk about a brand’s marketing content in word-of-mouth conversations. This caused the brand to fall 17 spots to number 21. In February 2018, the brand aired a commercial entirely in French during the Grammy Awards. Rather than spark conversation, the ad simply confused many consumers. 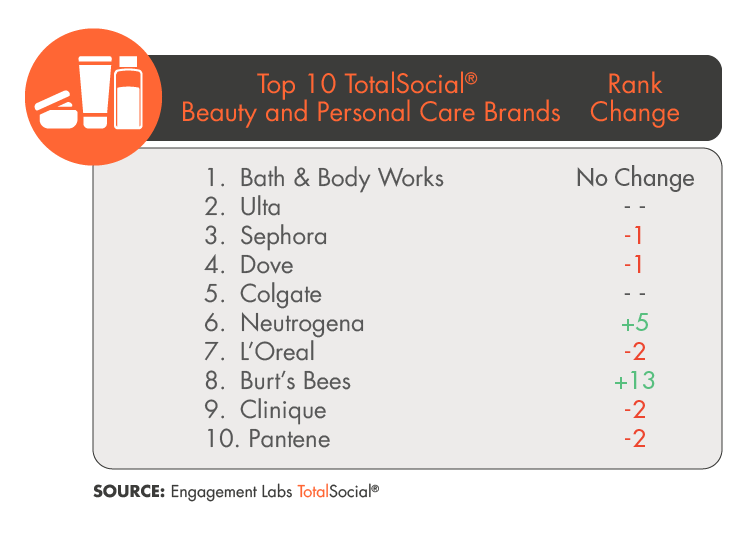 According to Engagement Labs’ report, Old Spice wasn’t the only falling star. Lower offline sentiment caused MAC Cosmetics to experience a precipitous drop – to number 22 from number six. The beauty brand has found itself at the center of a controversy with animal rights activists who oppose the sale of MAC products in China, where brands are still required to conduct animal testing for cosmetic products sold there.